Tamale (also called tamalli, tamal, or nacatamal) is a traditional dish made with corn masa. It originated from Mexico and Central America, but it can be seen all over the world today in countless variations. Whether you’re filling your tamales with spicy meat or sweet sultanas, the essential things remain the same. You still wrap the mixture in corn husk and cook it by steaming. Preparing tamale is quite tedious and involves many hands. Like all traditional dishes, generations found ways to keep tamales alive to this day. Family and friends make it the center of a gathering called tamalada (tamale-making). So instead of the host single-handedly cooking this delectable but labor-intensive dish, the party becomes an enjoyable time to prepare tamales together. Tamale is not a one-time recipe that you learn to do and forget. It’s one that you learn from your mother and aunts, perfecting the craft before passing it down to the younger ones. It’s a cultural and generational thing, and for this, you will need the best tamale steamer or tamalera there is. 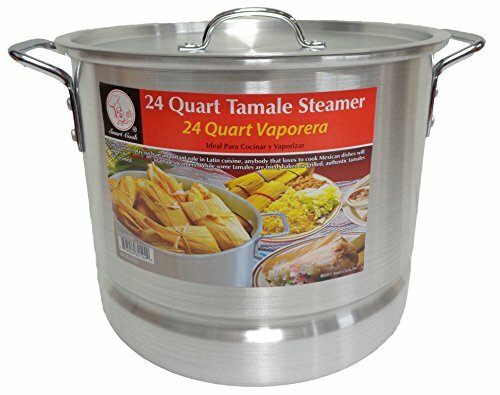 What makes the best tamale steamer pot? Will any steamer make a good tamalera? Unfortunately, not all steamers can be used for cooking tamales. Why is this so? Tamales are cooked upright, so you will need a steamer that accommodates the average height of your tamales. Most all-around steamers are not tall enough for piling tamales upright. When deciding to buy a tamale steamer, you have to consider the size, material, steaming accessories, and price. 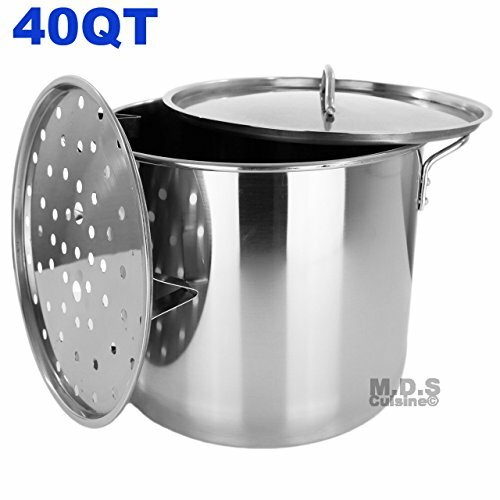 The sizes of tamale steamers range from 10 quarts to 80 quarts. Here’s how you figure out the right steamer size for the number of tamales you want to cook at a time. The number of tamales you can cook per batch will vary depending on the size of your tamales and the pot. Generally, though, a 10-qt tamalera will be just right for 30 regular-size tamales. A 28-qt steamer pot will make you 90-100 tamales per batch. As mentioned earlier, take note of the height from the steamer’s base to the rim of the pot (when the steamer rack is set up inside the pot). This measurement must not be less than the usual height of your tamales when piled vertically. Of course, you can make short or square-shaped tamales. We’ve seen many variations like that, but traditional tamales are long and open on the top end or tied on both ends. A pot of 10-20 quarts will work great if you typically make tamales for the family, but a larger one (at least 32 quarts) will be more appropriate if you aim to become a tamalada host. Tamaleras are available in aluminum, stainless steel, carbon steel, and galvanized metal. Galvanized iron tamale steamers are durable and generally inexpensive. They can be pretty heavy, though, which sometimes doesn’t sit well with glass-style cooktops. We favor high-gauge aluminum and stainless steel because they are relatively light, hard wearing, good heat conductors, and easy to clean. The steamer rack is what makes a pot a steamer; otherwise, it’s just a stock pot. It’s usually a steamer insert or basket that keeps the tamales from getting soaked in water. Perforations on the rack allow steam to get through to cook the freshly-wrapped tamales or to warm frozen tamales. The lid of the steamer must be heavy and tight enough to prevent steam and heat from escaping the pot. A towel placed on top of the stacked tamales prevents the release of steam, but it’s a good idea to have a tightfitting lid in the first place. Some cooks prefer glass lids because they can peek through the lid without opening it and letting out steam. We’ve mentioned the most important considerations, but you may also want to look into other features. For really huge pots, it’s safer to have riveted handles. Some cooks may prefer handles that are cool to the touch. It will be a plus if the steamer that you choose doubles up as a stock pot or deep fryer. That will make it more versatile in the kitchen, since you likely won’t be dishing out tamales every single week. With these criteria in mind, we’ve listed our picks for the 7 best tamale steamers on the market today. See what models made it to our list below. Gas One’s 24-qt stainless steel tamale steamer has 1.0-mm thick walls and base. 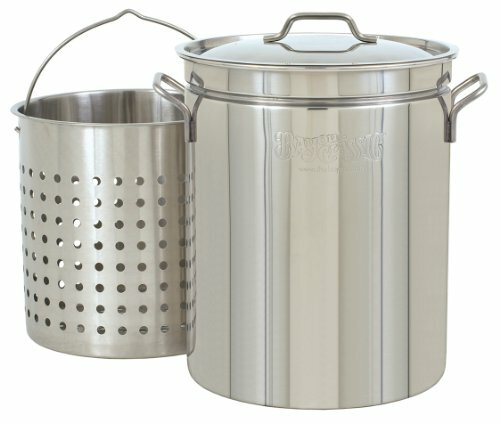 This solidly crafted pot comes with riveted handles, a rack-style steamer insert, and a flat lid. It has an inside diameter of 11.75″ and height of 12.75″. At this size, it can accommodate 50-60 tamales stacked upright. You will have no problem with this steamer’s heat conduction and retention properties even when cooking outdoors. Its thick gauge and high-grade construction make it capable of withstanding high temperatures. You can look forward to years of steaming, boiling, and frying with it. This pot’s slightly convex base will sit perfectly on top of a burner grate, but may not work as well for flat glass cooktops. Bayou Classic 4042 is made of aluminum, and it’s bigger than our first two steamers. It has riveted handles and a slightly domed lid. Like Bayou Classic 1136, its steamer accessory is also a perforated basket. The basket makes it easier to take out the steamed food in one lift. The basket, which mounts at 1.75 inches from the bottom, also doubles as a colander for boiled pasta or blanched vegetables. 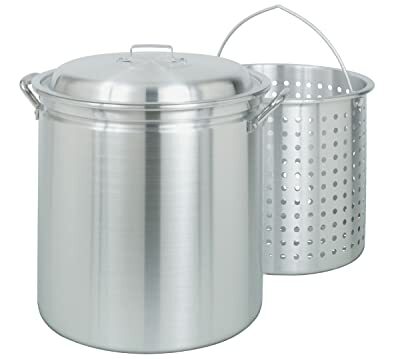 The pot is ideal for general boiling purposes, with or without the basket. It is also suitable for making stews and boiling crabs. This aluminum tamale steamer pot has an advantage over stainless steel pots. It heats up faster and brings water to its boiling point quicker. On the downside, it loses heat rather quickly, especially when cooking outdoors where it’s windy or cold. Take note that this one is huge, and you won’t have any problem fitting 140-150 tamales per load. If you’re not into hosting tamaladas or commercial tamale cooking, then check out the 24-qt version of this pot. Don’t use this one for frying since it is not a fryer. 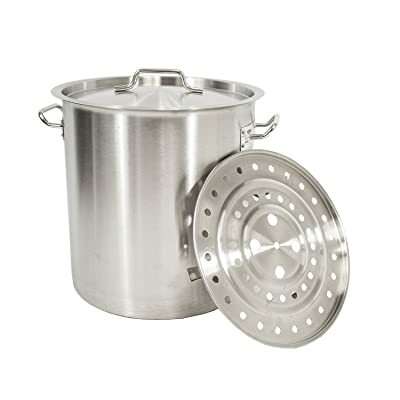 For cooking large batches of tamales, Bayou Classic’s 32-quart stainless steel steamer fits the bill. It is made of 304-grade steel and has a perforated basket which is raised 3” from the bottom. This tamalera easily cooks 100 tamales per load. The lid is vented to allow for uniform circulation of steam and heat. The distance between the bottom of the pot and the base of the basket allows for enough water to cook a whole batch. This way, you don’t have to open the lid and lose steam just because the water level is low and you need to add water. This steamer is so versatile that you can boil potatoes or even deep-fry a turkey in it. Take note, though, that 304-grade steel can rust with constant exposure to salt. Welds, not rivets, attach the handles to the pot, but the welding looks pretty solid. Nevertheless, don’t fill the pot with water if you intend to lift or move it after boiling. We find the material to be not so thick at 0.8mm, but it feels sturdy enough for steaming and boiling. When properly cleaned and dried after each use, this pot will last many years of tamale-making. You’ll be churning out tamales in no time with this commercial-grade 40-qt MDS Cuisine steamer. 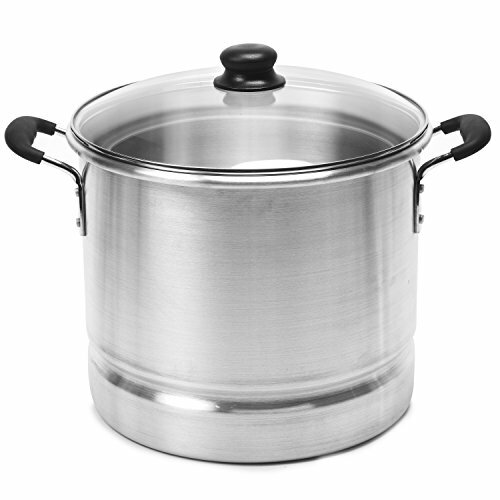 This pot, including its flat lid and riveted handles, is made of stainless steel. Like the Gas One pot, this has a rack-type steamer insert. You can use this for cooking indoors or outdoors. It works on any stovetop type, whether induction, gas, or electric coil cooktop. We find it sturdily built for all-around cooking, such as making tamales, cooking lobsters, or brewing beer. The steel material used is not as thick as described but not cheaply so. Don’t soak this pot in salty water or use bleach when washing it. Proper upkeep, like cleaning and drying after each use, will prevent rusting. For a few bucks, you can have a decent tamalera for family cooking. Smart Cook’s 24-qt aluminum tamale steamer is just the right size for a batch of 50-60 tamales. The pot is 10.75” high. It has riveted handles, a flat aluminum lid, and a perforated steamer insert. 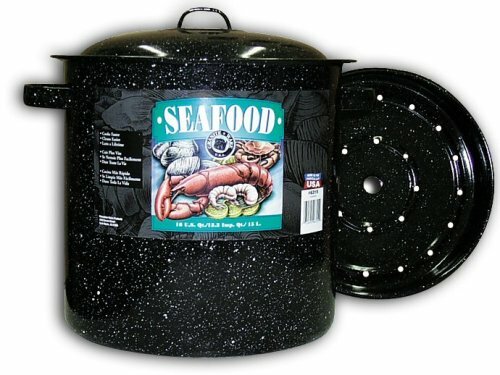 This versatile pot can also be used for steaming seafood and vegetables and for making stews and soups. At 24 quarts, this is one lightweight pot that does the job without occupying too much space when stored. It’s easy to move around and clean up. In the picture, it looks like the pot tapers from the top to the base, but the actual pot is fairly straight. There’s no need to worry about your tamales leaning to the side or going out of shape. Other bigger sizes are available, including the 32-qt size which you will find at the same price point as this one. We’re happy to feature this steamer because it has some cool features that the other models don’t have. IMUSA USA Mexicana 428 is the only steamer in this list with a tempered glass lid and cool-touch handles and knob. At 28 quarts, this aluminum tamale steamer with glass lid can load five dozens of tamales at a time. Like the others, you can use it to steam seafood and vegetables. The steamer sits 2” above the pot’s base, high enough so that water will not bubble through the steamer insert’s holes and make your tamales soggy. You have to be aware of one issue, though. It’s not only with this steamer but concerns all models that use steamer insert racks. When you need to add water midway through cooking time, you’ll need to move several tamales aside or out of the pot to make way for pouring the water. That can be a chore for some. If you want to use this as stock pot or boiler, remove the steamer insert, and you’re good to go. It’s perfect for cooking soups and stews. One disadvantage of glass lids is that they’ll break if you accidentally drop them. Unfortunately, the maker of this pot does not sell replacement lids, which is a slight disappointment. This glassy porcelain-coated tamale steamer from Granite Ware is one irresistible looker. It’s not only the laminated look that got our attention, but also its make. The core of this pot is hard-wearing carbon steel, which distributes heat very well. The porcelain finish has a practical purpose, too – it makes the surface nonstick, nonreactive to food, and easy to clean. This all-around pot comes with loop handles, a slightly convex lid, and a perforated insert. Its size easily packs in 3-4 dozen tamales. You may also use the pot for steaming crabs and lobsters or, without the insert, for boiling stock or making stew. We recommend using it on top of electric or gas burners but not on glass cooktops. We also suggest that you hand wash it instead of putting it in a dishwasher. It cleans with soap and water so well, so that shouldn’t be a chore. Summing up, the best tamale steamer is one that fits your needs, has the right size, and matches with your existing kitchen equipment and fixtures. Ask yourself questions like, “Will it work on my cooktop?” or “Can I wash it on my sink, or do I need to haul it to the bathroom?” The bottom line is that the pot you choose must work for the cook that you are and in the kitchen that you have. We hope that you find this guide valuable in making that decision.